The 2017 College Football season is starting later this month and that means it is prediction season. We will do something different than last year. In 2016, we made 5 predictions for each conference for a total of 55 predictions. The final total was 30.5 predictions correct for 55.5% hit rate. This edition is the third and we will start predicting the Power 5 Conferences. Below is the schedule for the 25 predictions. 15. (Big 12) Oklahoma State will lead the Big 12 in points scored – The Cowboys have 7 starters back on offense including the key skill positions. Quarterback Mason Rudolph threw for 4,091 yards (63.4%) with 28 touchdowns and only four interceptions. Three of his top four targets from 2016 return led by James Washington. Washington had 71 catches for 1,380 yards with 10 touchdowns while Jalen McCleskey had 73 receptions for 812 yards and 7 touchdowns. There is also the threat of Justice Hill in the backfield with Rudolph as he had 1,142 yards and 6 touchdowns. With three starters back on the line, this team should eclipse 2016’s numbers of 38.6 points and 495 yards per game. The Big 12 is full of potent offenses starting with Oklahoma. The Sooners had 43.9 points per game in 2016 and lost four big names: head coach Bob Stoops, receiver Dede Westbrook, and running backs Joe Mixon and Samaje Perine. Even with Heisman candidate Baker Mayfield back, the Sooners could see a slight step back on offense. Another potent team is TCU who returns 10 starters from a group that underachieved in 2016 when only 2 starters returned. Every top skill position player returns for the Horned Frogs and they will easily eclipse the 31 points per game they averaged in 2016. Both Texas and Baylor welcome new coaches. Texas has Tom Herman and his offense though there will probably be a few hiccups as it is installed. Baylor is typically one of the highest scoring offenses (over 44 points per game from 2011 through 2015) but Matt Rhule has a more pro-style system. The other big threat to the scoring title is Texas Tech under Kliff Kingsbury’s high flying offense. The Red Raiders lose quarterback Patrick Mahomes and top receiver Jonathan Giles, but most other key pieces return. They will still put up points, but with a new starter might lead to a drop off in points (43.7 per game in 2016). 14. (Big 12) TCU will win the Big 12 Championship – 2017 sees the return of the Big 12 Championship Game ostensibly to help the conference from getting left out of the College Football Playoffs. We will see if the re-introduction has the intended effect. As for the return of the game, we like TCU to win the 2017 edition. There is no doubt that 2016 was a subpar season for the Horned Frogs when they finished 6-7. The offense had only 2 starters back and averaged just 31 points per game (down 11 points per game from 2015). The biggest disappointment was defense, which actually got worse with 8 starters back. In 2016, they allowed 28 points and 427 yards per game (about 1 point and 30 yards per game worse than 2015). 2017 sees a much more experienced offense with 10 starters back. Kenny Hill had an up and down season with 17 touchdowns and 13 picks, but he returns all of the key position players. After putting up 31 points and 463 yards per game in 2016, they should get close or even go beyond 40 points per contest. On defense, 7 starters are back including 5 of the top 6 tacklers. Travin Howard (130 tackles) and Ty Summers (121 tackles) will command the secondary and linebackers respectively. Even in a high scoring league like the Big 12, the defense should improve from the 28 points and 427 yards per game they allowed in 2016. The Horned Frogs have five Big 12 road games including some tough ones at Oklahoma State, Kansas State, Oklahoma, and even a potentially tricky game at Iowa State. The Oklahoma State game is in week four and could end up deciding one of the participants for the Big 12 Championship Game. TCU is flying under the radar and this team is in a very good position to win the Big 12. 13. (Big 12) Iowa State will reach a bowl game – The Cyclones have not been to a bowl game since 2012 when they played in the Liberty Bowl, but lost to Tulsa 31-17. Matt Campbell was hired in late 2015, just a day after former coach Paul Rhoads coached his final game. Iowa State went 3-9 in 2016 and the biggest highlight was their dismantling of Texas Tech 66-10 in the penultimate game of the year. The second year should see improvements on both sides of the ball. The offense had a respectable 27.7 points per game in 2016 with just three starters back, a new coach, and constant quarterback shuffling. Jacob Park is the man now after throwing for 1,791 yards with 12 touchdowns and 5 interceptions. The top two receivers and running backs return including Allen Lazard. Lazard had 69 catches for 1,118 yards with 7 touchdowns and needs 678 yards to become the school’s all-time leading receiver. The offense should top 30 points per game with more quarterback stability and more experience and knowledge of the offense. The defense did okay in 2016 with a new coach and 7 starters back. They allowed 31.3 points and 453 yards per game, which was actually 1.4 points per game less. Six starters are back and a slight improvement would go along way for this team. The schedule starts with Northern Iowa and Iowa at home before a road trip to Akron. The Cyclones need a 2-1 at worst to give them any shot of reaching a bowl. They only get four home games in the Big 12 (Texas, Kansas, TCU, and Oklahoma State) and will probably need to win at least two of those. The five road games are at Oklahoma, Texas Tech, West Virginia, Baylor, and Kansas State. There is no margin for error given their schedule, but the Cyclones have the pieces to get 6 wins in Matt Campbell’s second year. 12. (Pac-12) Washington State will reach double digit wins – We are very bullish on the Cougars this year thanks to 16 returning starters (7 on offense and 9 on defense) and schedule (not easy, but manageable). Mike Leach will be in year 6 at Wazzu with a very experienced Luke Falk. Falk is a senior in 2017 and he loses two of his top three wideouts (Gabe Marks and River Cracraft). Despite those two, Falk distributing the ball will help absorb the losses. Also returning are the top three running backs who averaged 120 yards per game in 2016. That was the highest amount for the offense under Leach at Washington State. One of the bigger surprises the last two seasons has been the defense. In 2015 they allowed 27.7 points and 417 yards per game while 2016 was small improvements to 26.4 points and 406 yards per game. Those have been the best numbers under Leach and coincides with the hiring of defensive coordinator Alex Grinch. With 9 starters back in 2017, there could be even more improvement in the numbers. The schedule is not easy, but the Cougars do not play a road game until October. They open with five straight at home against Montana State, Boise State, Oregon State, Nevada, and USC. The Broncos and Trojans will be tough contests, but being in Pullman will give them a better chance to win both games. October is road stretch with Oregon (away), California (away), Colorado (home), and Arizona (away). All four are winnable though a resurgent Oregon team might be the trickiest. The schedule closes with Stanford (home), Utah (away), and Washington (away) after a bye week. The Pac-12 North looks very competitive, but the Cougars are set up for success on offense and defense. Washington State is a dark horse to win the North so long as they take care of USC and Washington, but those would both be big upsets. 11. (Pac-12) Colorado will reach a second straight bowl game – Colorado surprised many in 2016 when they made the Pac-12 Championship Game as the South division winners. A repeat of that in 2017 would be just as surprising, but they still have a great chance at reaching a second straight bowl. The offense returns mostly intact with 9 starters back, however, they lose quarterback Sefo Liufau. His replacement is Steven Montez and he did get some playing time in 2016 when Liufau was injured so the drop off may not be as severe. All the top receivers return as does running back Phillip Lindsay (1,252 yards and 16 touchdowns). The offense put up 31.1 points and 437 yards per game in 2016 and should get close or top those numbers again this season. Defense is a major concern with only three starters back from a group that allowed 21.7 points and 343 yards per game. Three of the top five tacklers are back with two of those in the secondary. There are quite a few upperclassmen as projected starters, but the numbers will still get worse. The Buffs will start with four games within the state of Colorado: Colorado State (in Denver), Texas State, Northern Colorado, and Washington with the latter three at home. The CSU game may not be the walk in the park as expected because the Rams will have already played one game and look like a contender in the Mountain West. Three of the next four are away: UCLA, Arizona (home), Oregon State, and Washington State. The season concludes with California (home), Arizona State (away), USC (home), and Utah (away). There are enough wins on the schedule (both home and away) for the Buffs to make back-to-back bowl games for the first time since 2004-05. That concludes the third set of five predictions for the 2017 college football season. Check back next week for predictions 10 through 6, which will be one more prediction for the Pac-12, three for the ACC, and one for the SEC. The 2016 College Football season is coming fast and that means prediction time. Below are five predictions for Big 12 Conference for the 2016 season. Some predictions will be right, some predictions will be wrong, and some will be spectacularly awful (or correct) by the end of the season. There are no changes for the Big 12 Conference as the ten teams remain the same. Those ten teams are Baylor, Iowa State, Kansas, Kansas State, Oklahoma, Oklahoma State, TCU, Texas, Texas Tech, and West Virginia. In addition, the Big 12 employs a true round robin in which each team will play one another. 1. Kansas State will make a seventh straight bowl game – Bill Snyder has a special touch with this Kansas State program. He took them from the doldrums in the late 80’s to national prominence in the late 90’s. Since returning to the Wildcats in 2009, Snyder led the team to a bowl game each year with the exception of that 2009 season when they went 6-6. This year the Wildcats have five starters back on offense and seven back on defense. The defense underperformed last year giving up 31.5 points and 452 yards per game with those totals the highest since Snyder’s return. The defense should be better after a poor 2015 season. The schedule has some bumps with the opening game at Stanford on Friday, September 2. They also face West Virginia, Oklahoma, Iowa State, Baylor, and TCU on the road in conference play, but three wins is not out of the question between those teams. At home the Wildcats will play Florida Atlantic and Missouri State in non-conference (two presumed wins) while playing Texas Tech, Texas, Oklahoma State, and Kansas. The Wildcats looked poised for another bowl game in 2016 and a few upsets look like they are in the cards as well. 2. Oklahoma will lose at least one game they are favored in – This is a common theme for Oklahoma under Bob Stoops, but this one will not necessarily be a bad thing. 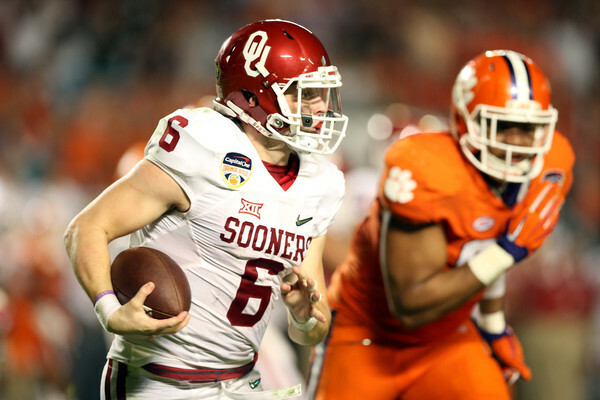 After the Sooners lost to Texas in 2015, they went on a tear by winning their final seven games and reaching the CFB Playoffs where they lost to Clemson 37-17. In 2014, Oklahoma lost to TCU, Kansas State, Baylor, and Oklahoma State while favored in each of those games. In 2013, they lost to Texas as a 12 point favorite while in 2012 they lost to both Kansas State and Notre Dame at home as a double digit favorite. 2011 saw them drop games to Texas Tech (favored by 28.5 points) and Baylor (15.5 point favorites). The chances Oklahoma drops a game they should not are pretty good, but that does not mean the CFB playoffs are out of reach. 3. West Virginia will not win more than 7 games – The offense for West Virginia will be solid in 2016 with eight starters back from a group that put up 34 points and 480 yards per game last season. The defense took a hit as only four starters are back from the 2015 group that allowed 24.6 points and 396 yards per game. The schedule opens with Missouri and Youngstown State at home before facing BYU in Maryland for a neutral site game. In conference, they play Kansas State, TCU, Kansas, Oklahoma, and Baylor at home while facing Texas Tech, Oklahoma State, Texas, and Iowa State on the road. There does not appear to be enough on the schedule for the West Virginia to get more than seven wins, but they could find their way to a bowl game at 6-6. 4. 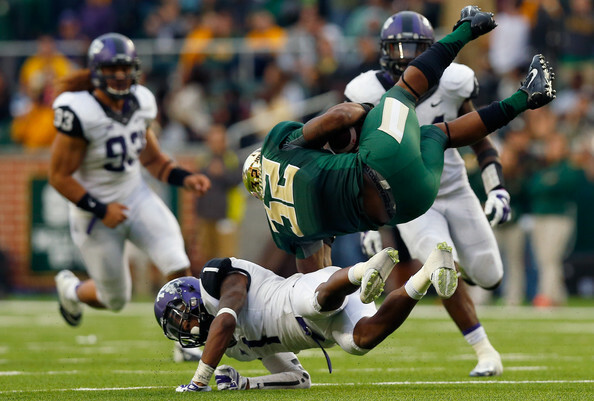 TCU and Baylor will win 20 games or less combined – TCU went 12-1 in 2014 and 11-2 in 2015 while Baylor went 11-2 in 2014 and 10-3 in 2015. A repeat of even the worst outcome for those two would prove this one wrong. TCU lost a lot of offensive firepower as quarterback Trevone Boykin, running back Aaron Green, and receiver Josh Doctson have moved on to the NFL. The offense put up 42.1 points and 563 yards per game in 2015 but only three starters are back. TCU does get former Texas A&M quarterback Kenny Hill for 2016 which definitely helps. The defense for TCU will be the strength as eight starters are back from last year’s group that allowed 27.2 points and 398 yards per game. This group should keep TCU in every game and the Horned Frogs look like the better of the two teams here. For Baylor, they have plenty of concerns led by the ouster of former head coach Art Briles. He was replaced with Jim Grobe who is more of a defensive minded coach though he has kept most of the assistants from last year. Losing the mastermind of the offense, which has only five starters back, will no doubt hurt. Meanwhile on defense, there are also only five starters back from a unit that allowed 28.3 points and 397 yards per game in 2015. Those numbers were put up with nine starters back last year. There is enough turmoil and turnover that Baylor could take a step back in 2016. 5. Texas and Texas Tech will both make a bowl game – Texas did not make a bowl game in 2015 after going 5-7, but did make a bowl game in Charlie Strong’s first season in 2014 (a 31-7 loss to Arkansas). Texas Tech did the opposite: they missed a bowl game in 2014, but made the Texas Bowl last year where they were crushed by LSU 56-27. Texas is likely to make a bowl game as they will be in Strong’s third season with seven starters back on offense and eight starters back on defense. The offense improved by five points and 34 yards per game from 2014 to 2015, but the defense took a step back. After allowing 23.8 points and 349 yards per contest in 2014, they gave up 30.3 points and 453 yards per game last year. The Longhorns play Notre Dame and UTEP at home as well as California on the road in non-conference, but there is no reason the Longhorns should not improve enough to have a winning record in 2016. Texas Tech is the more worrisome team to make a bowl game. The offense will be prolific again in 2016 as they have six starters back led by quarterback Patrick Mahomes and a bevy of receivers to throw to. The defense is the worry as they allowed 43.6 points and 548 yards per game in 2015 with eight starters back and now there are six starters back. It could be another year of feasting for Big 12 offenses on the Red Raider defense. For Texas Tech, they face Stephen F Austin, Arizona State (away), and Louisiana Tech in non-conference and a 2-1 record is likely and 3-0 is possible if they are in a shootout with the Sun Devils. In conference, they play Kansas, West Virginia, Oklahoma and Texas at home while facing Kansas State, TCU, Oklahoma State, and Iowa State on the road. Their final conference game is against Baylor in Arlington, Texas. With the Big 12 predictions above, there are now predictions for seven conferences in the books. Below are the predictions completed and which conference is next. The 2016 NCAA Division 1 Baseball Tournament has reached the final venue with the 2016 College World Series ready to begin. The eight teams that won their Super Regional will meet in Omaha, Nebraska to play in a double elimination format until two teams are left standing. Those two teams will then play in a best of three Championship Series to determine the National Champion. The College World Series will begin on Saturday, June 18 and the double elimination portion will end on Saturday, June 25. The Championship Series will begin on Monday, June 27. Below are the eight teams that made the 2016 College World Series with both Coastal Carolina and UC Santa Barbara making their first appearance. 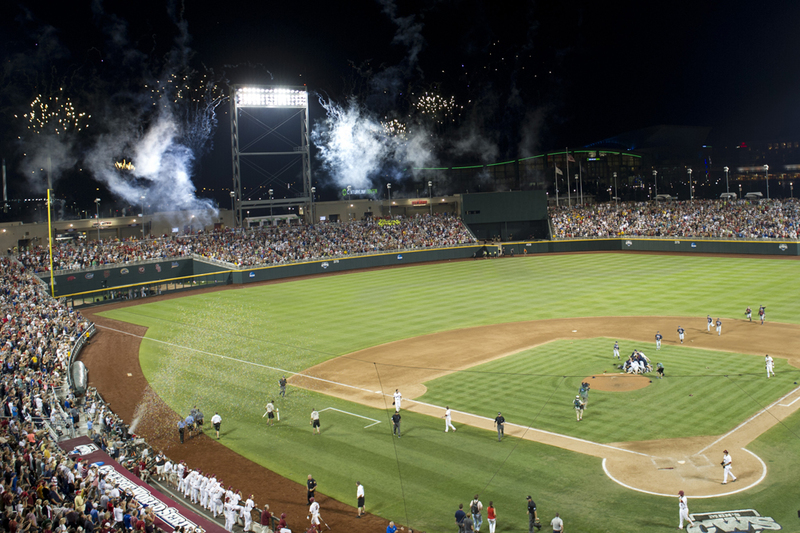 All games at the 2016 College World Series will take place at TD Ameritrade Park Omaha. Below is the schedule for the 2016 College World Series. An updated bracket can be found here. Super Regional scores can be found here while Regional scores can be found here. The Championship Series Schedule can be found at the bottom. The schedules below are subject to change due to weather or NCAA decisions. Former Oklahoma State player Tyreek Hill will be playing for the Akron Zips, according to Hill’s Twitter account. Hill led the Cowboys in all-purpose yardage in 2014 with 1,811 yards. Hill spent the 2014 season at Oklahoma State and was utilized in a number of different capacities. As a running back, he was second on the team with 534 yards rushing on 102 carries while also scoring one touchdown. He also had 31 catches for 281 yards and a touchdown, but was also used on both kick and punt returns. He returned 27 punts for 256 yards (9.5 average) and a touchdown. On kickoffs, he had an average of 24.7 yards per return and 2 touchdowns (3o returns for 740 yards). 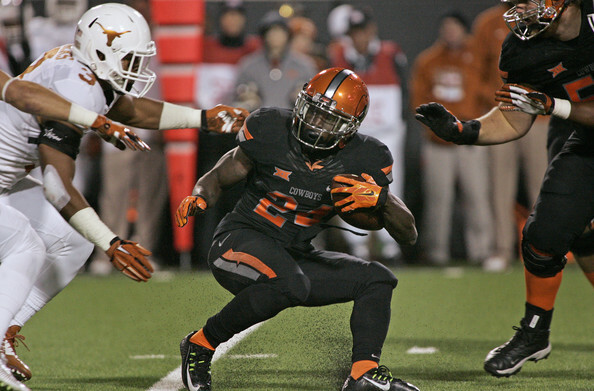 Hill was named the Big 12 Offensive Newcomer of the Year for his efforts. Hill was dismissed from Oklahoma State on December 12 after being arrested and charged with a felony complaint of domestic violence. Hill played at Garden City Community College in 2013 prior to transferring to Oklahoma State.